Are bees endangered because of the use of insecticides, and in particular the class of chemicals known as neonicotinoids, which are used on many crops? It’s a debate that’s played out in research laboratories and in the media over the past decade since the phenomenon known as Colony Collapse Disorder roiled the bee industry in California and elsewhere in North American and Europe beginning in 2006-7. Needless to point out to those who have followed the neonics controversy, this is a highly politicized issue. Most people with a stake in this debate, including entomologists, farmers and beekeepers, are genuinely struggling to understand the complex factors behind why bees face a host of problems, from attacks from the killer varroa destructor mite to the overuse of insecticides to kill them and the pervasive use of agricultural pesticides. But in the media and in cyberspace, hyperbole and ideology have come to eclipse rational discussion and the sometimes plodding pace of science. The highly-charged debate now pits activists, including some advocacy-minded scientists, against the agro-chemical industry and many scientists who view neonics as a relatively minor driving force in the health issues confronting honeybees and bumble bees. One resource that has often been looked upon by the media as an objective source is the Bee Informed Partnership (BIP)—a US Department of Agriculture project developed in cooperation with University of Maryland entomologist Dennis vanEngelsdorp. Each year in the spring it releases an annual U.S. ‘bee hive loss estimate’. Each year, it seems, the report frames the debate over whether the ‘bee crisis’ is accelerating or abating. The popular narrative among journalists and on the Internet in recent years has been that honey bees and wild bees face impending doom—it’s been dubbed a beepocalypse or beemageddon, with most of the ire focused on a class of pesticides, applied mostly as a seed coating, known as neonicotinoids. The insecticide was introduced in the 1990s in large part to replace chemicals that were demonstrably hurting bees and posed human health dangers as well. Bee health is a genuine concern. 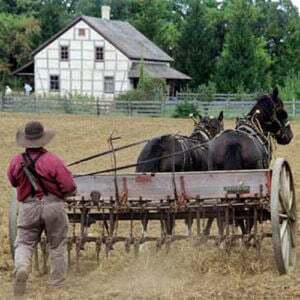 After all they are trucked around from farm to farm as insect livestock. 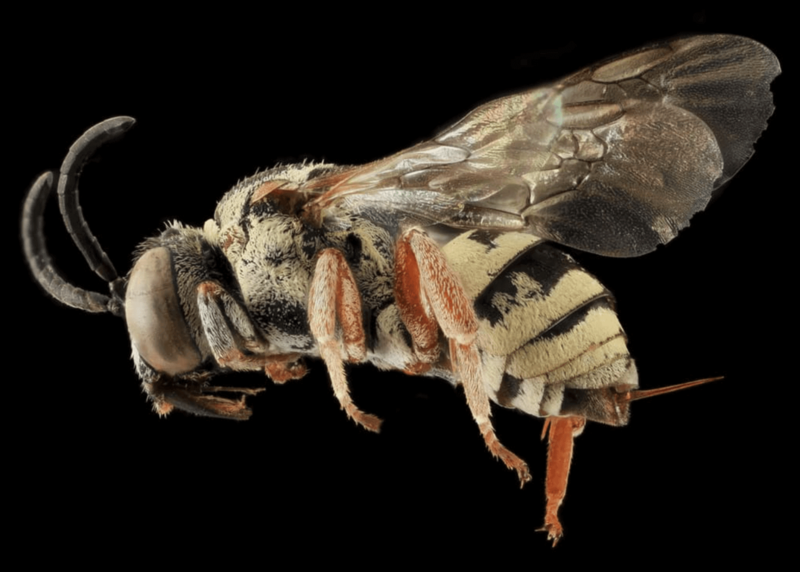 And entomologists and the USDA say that varroa mites have been infesting bee hives at an accelerating rate over the past few decades, and present a serious and on-going threat. Pesticides rank low as a likely cause of bee health problems, contend most entomologists, but that’s not the way the issue has played out in the media and online. Anti-pesticide campaigners have long rejected the conclusions of government agencies and scientists, deciding that bee health issues could not be driven by something as prosaic as a well-known parasite, and have focused instead on neonics. The question of the relative role of neonics in bee health is fascinating because of the split in the science—some lab studies point to potential serious problems linked to one or more of the neonics but field research, meta-studies and the hard numbers worldwide—bee hives are at record numbers globally—tell a much different story. The release of BIP’s death count has become a spring ritual followed closely by those invested in beepocalypse narrative; in years when the BIP loss numbers have been high, the media has generally taken them as confirmation that the disaster has finally arrived. Activists fill the social media echo chamber with scare blogs, which they often use as an anchor issue for fund raising or campaigns. But the most recent year’s survey results didn’t exactly support that narrative. Over-winter losses, which is when bees face severe threats from cold weather, were 21.1%, the lowest in the 10 years the survey has been in existence. Taken together with previous years’ findings, the 2016-17 number continues a downward trend of over-winter losses that, on the current path, will reach the 15% goal set in the 2015 National Pollinator Strategy by 2024. Seven years ago, however, BIP began collecting survey responses on in-season (summertime) honeybee losses as well. However, combining in-season and over-winter losses can result in an alarming and spectacularly misleading loss number. For example, in 2016, it was 44%, making it appear that nearly half of all US honeybees had died, which is exactly how most of the media reported it. The first reason is that the macro statistics of the total bee population tell a different story than the BIP numbers. The previous year, when it was reported that “a third of the nation’s honeybee colonies died”, the US honeybee population actually reached a 22-year high. The untold story in the popular media, although reported on science-based websites like the GLP and on university and bee expert sites, is that despite some ups and downs, the number of honeybee colonies has remained remarkably stable since the mid-1990s, when neonicotinoids were introduced. They’ve hovered around 2.5 million hives in the US, even through the challenges of Colony Collapse Disorder from 2006-2010, with the last five years seeing significant growth in bee numbers. 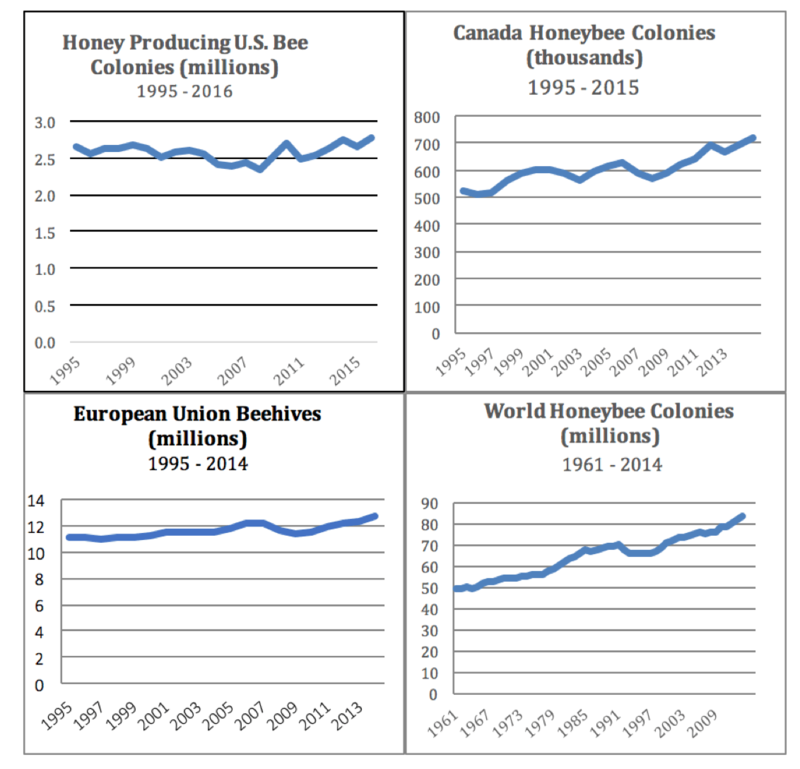 There was indeed a sharp dive in US bee numbers in the eighties and early nineties, when the Varroa mite invaded the US, but those declines leveled off and eventually reversed in the years neonics have been on the market. Overall numbers are steady or increasing in Canada, Europe and on every continent except Antarctica (where there are no honeybees), over the last 20 years—the entire period that neonicotinoid pesticides have been on the market. 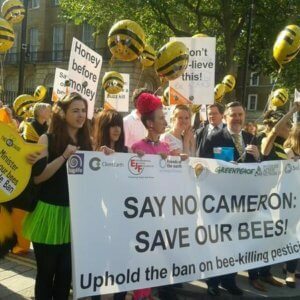 Despite these rising trends, inflammatory media stories and the NGO social media echo chamber have won the day in Europe, where politicians have put aside the findings of entomologists and appear to be preparing to not only extend their “temporary” 2013 ban, but expand it to almost all uses, even on crops bees never visit. The same activist groups – and of course the media – continue to exert enormous political pressure in the US to follow suit. 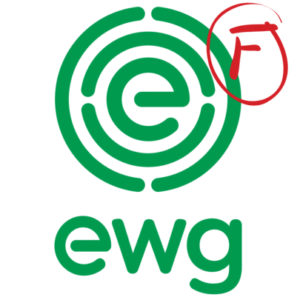 So far, EPA appears to be resisting, as their recent draft assessments of the three largest selling neonics suggests, but many close observers of the agency believe the process has been touch and go for some time. A new Bee Informed Partnership report will be out in a few months. 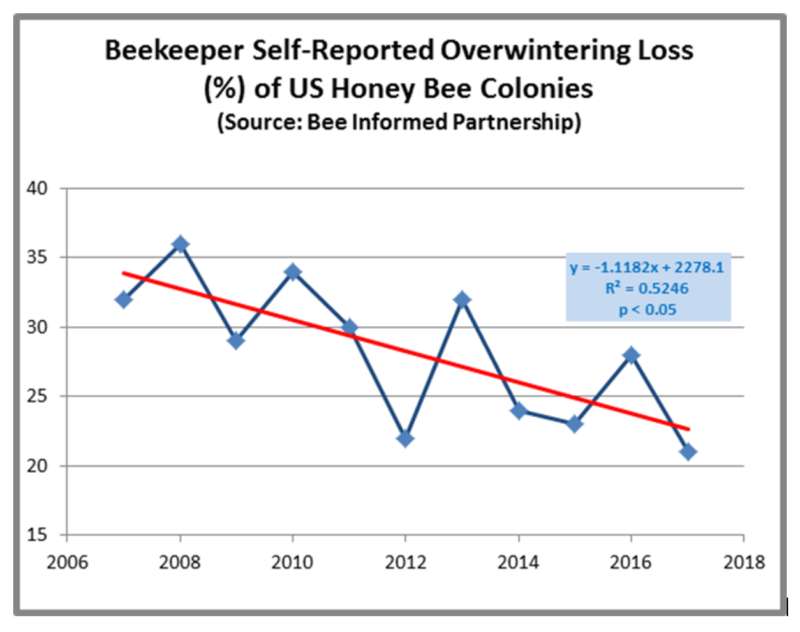 It will be interesting to see if reporters make the distinction between the normal seasonal bee colony losses experienced by beekeepers, which have been a factor in beekeeping since time immemorial, and overall population trends. Bees reproduce very rapidly—the normal life-span of a worker bee in the summer months is only 6 weeks—and so beekeepers can rebuild their hives very rapidly as well. Not long ago, many beekeepers in northern latitudes, particularly in Canada, where intense cold makes keeping bees over winter a challenge, would empty their hives of bees, harvest all the honey in them, and start over with new queens and purchased ‘packaged bees’ the next spring. They had a self-inflicted 100% loss rate. But they had healthy, thriving bee populations throughout the summer and a stable, thriving beekeeping industry as well. Colony losses, whether overwinter or in the spring, represent an economic cost to beekeepers, and they can provide clues to overall hive health. But the numbers we see in recent years do not portend calamity. In fact, they can, and do, rise and fall with little effect on the total number of beehives in the country, or in the world—which is almost entirely determined by how many bee colonies beekeepers decide to “grow.” This, in turn, is largely determined by economic considerations—the price of honey or the going rate for pollination services. Predictably, however, every time the Bee Informed Partnership releases its headline-grabbing annual loss number, the media prophesizes doom. A rough analogy might be if a stock market survey only reported those stocks that had experienced losses at some point during the year, without bothering to mention that overall the market was steady or rising. One might argue that it’s not BIP’s responsibility to ensure that the media doesn’t misinterpret or misuse its statistics. Fair enough. There’s also no question that Dennis vanEngelsdorp, who initiated the BIP, is someone dedicated to the welfare of honeybees and beekeepers. It was vanEngelsdorp and a co-author who conducted the first research into the mysterious disappearance of worker bees from the hive, a phenomenon they dubbed Colony collapse Disorder”, and he has been one of the nation’s foremost investigators of the many diseases afflicting bees today. All of this, however, simply casts the problems with the bee loss survey into starker relief. Any scientist—or indeed any competent science reporter—taking a close look at the BIP’s methodology would have to acknowledge that it suffers from numerous limitations, and some of them are so severe that they make its results practically meaningless as a guide to the true state of bee populations. This brings us to the second big problem: the BIP’s numbers are drawn from a voluntary survey, to which most beekeepers don’t bother to respond. In fact, BIP data typically represent only a small fraction of all beekeepers in the US—about 13% for 2016-17. That would be a large enough sample for a scientifically randomized poll, as we’ve grown accustomed to in politics. But BIP simply mails its questionnaire to beekeepers and tallies up the results of those who send it back. As the respondents are self-selected, one would intuitively assume that the results would be biased toward beekeepers with serious loss problems. And indeed, this appears to be the case. The vast majority of respondents are small or hobby beekeepers, with only a vanishingly small fraction of commercial beekeepers—1.4%—participating. There are in fact many more hobby beekeepers in the US than commercial bee keepers, but they represent a small fraction of the overall bee colonies. Why does this matter? It’s well known that many small and hobby beekeepers have the worst bee problems, most likely because of inexperience. They often neglect to treat for varroa and other diseases and can have much higher losses. BIP’s survey, however, has no mechanism for adjusting for these biases and it performs no analysis of the data to make its conclusions more representative. One sees this clearly as well in the enormous regional disparities. Twice as many honeybee colonies are located west of the Mississippi as east of it, but twice as many beekeepers are located east of the Mississippi. In other words, larger beekeeping operations in the west; smaller and backyard/hobbyist beekeepers in the east. But the over-concentration of BIP respondents in one region —or even in certain states within regions—can easily skew the results. In the 2015-16 BIP survey, for instance, Ohio and Pennsylvania were heavily over-represented (with some colonies from those states being double-counted for Florida as well). And the spotty, inconsistent nature of the survey can create huge distortions. In one case, a single queen breeder in California reportedly engaged the BIP investigators to survey his operations in California and Montana – yielding more than 10 times the number of BIP data points from his operations alone than for the entire remainder of California. In another instance in Montana, a single large operator who experienced devastating losses (due to error, carelessness or bad luck) caused the state to be depicted by BIP as a ‘heavy loss’ state even though none of the other beekeepers in the state experienced abnormal losses. Given the BIP survey’s limitations, and particularly its skewed representation of the size and geography of the beekeeping operations responding, perhaps its findings would be more useful if they were portrayed not as national honey bee colony loss statistics, which they are not, but rather as the losses experienced by those sectors of the beekeeping industry that actually respond to the BIP survey. Do other US bee hive data present a similar, problematic picture? 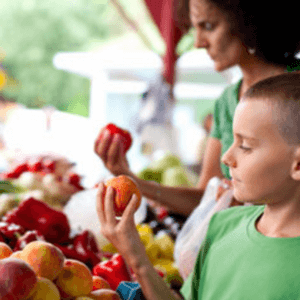 A third reason to be skeptical of the value of the BIP survey is that we have a more comprehensive survey conducted by USDA’s National Agricultural Statistics Service. Not surprisingly, it paints a very different picture of honeybees, and yields a much more dynamic picture of beekeepers’ operations over the course of the year. Unlike BIP, the NASS constructed a stratified sample of honey operations with which the Department has regular contact, backed up by telephone calls and, when necessary, enumeration for non-respondents. USDA charted colony losses, colonies added or renovated and total honeybee colonies in the U.S. by quarter, January 1, 2015 through March 1, 2016. Over the course of those 15 months, the total number of U.S. honeybee colonies fluctuated dramatically from a high of 3.1 million to a low, in the survey’s last quarter, of 2.6 million, with most quarters registering more than 2.8 million colonies. Along with losses, the NASS also charts additions. For examples, a total of 662 thousand colonies were added and 693 thousand colonies were “renovated” in just the one quarter of April-June 2015. In other words, normal beekeeping operations, in which operators decide to add or shed colonies in response to market conditions (demand and price, domestically and abroad, for different types and grades of honey, and/or anticipated commercial pollination needs and opportunities) can easily cause the total number of U.S. honey bee colonies to fluctuate by almost 20% within a 15-month period—even while populations compared year to year are steady or growing. This underscores the mistake of imagining U.S. honeybee colonies as a sort of natural population subject only to declines caused by environmental factors (e.g., pesticides). Rather, state-by-state and nationally, farmers and beekeepers are constantly adding to, fine-tuning and sometimes deliberately reducing their numbers of honey bee colonies in response to economic incentives. BIP’s self-selected and less-inclusive survey data needs to be compared with more comprehensive USDA data to be seen in proper perspective. One fortunate upshot of all of these survey efforts to assess honeybee losses of recent years is that they have thrown into relief the real, critical problem facing honeybees. It’s varroa mites—not pesticides, and particularly not neonicotinoiod pesticides that consistently rank among the least detected residues in honeybee colonies. Recent years’ Bee Informed Partnership surveys have correctly highlighted parasitic varroa and the dozen or more viruses and diseases that they vector into honey beehives as the #1 threat to honey bees. USDA’s NASS survey points to the same conclusion. So, does the practical experience of beekeepers in Australia, where there are no varroa mites, and Alberta, Canada, where authorities have made varroa control the overwhelming priority for beekeepers. This conclusion has been further reinforced by the 2016 multi-year study of disease incidence in honeybees co-authored by none other than vanEngelsdorp. It found varroa prevalence (as well as the bee gut fungus/parasite Nosema ceranae) among U.S. bee colonies far more extensive than previously thought and identified these, along with Deformed Wing Virus, as the principal scourges of honeybees today. So, why aren’t we concentrating on addressing the acknowledged parasite threat? One reason is that the varroa mite problem is very hard to address—trying to ‘kill a bug on a bug’, keeping one of them safe, is incredibly challenging. That’s especially true since varroa have shown a remarkably rapid ability to develop resistance to different treatment methods as they’re developed. For another, pesticides, and the large corporations that manufacture them, make a convenient and tempting target. One other thing is very clear from all these surveys—whether from the BIP, NASS, or various European efforts: bees are not facing an apocalypse or serious endangerment as the result of pesticide poisoning. Jon Entine is the Executive Director of the Genetic Literacy Project. His biography is here. Twitter: @jonentine.